Radiographs, also called X-rays, provide an important information about the condition of your teeth, roots, jaw, and overall facial bone composition. X-rays can reveal the advanced nature of periodontal disease, as well as tumors and abscesses. One of the most important responsibilities of a dentist is the responsible prescription of dental radiographs. 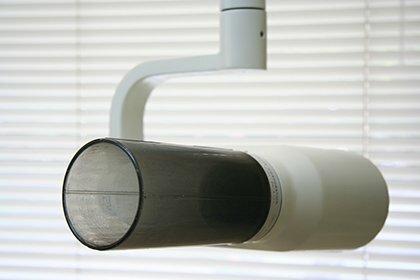 Dentists must weigh the benefits of taking radiographs versus the potential harm that could come from radiation of any source. Dr. Moore takes this seriously, and has taken steps to ensure that overall radiation exposure to his patients is minimized while the diagnostic information is maximized. As of November 1, 2006, all radiographs are now digitized. The result is a drastic reduction in radiation exposure of up to 80%, with approximately 10 times more diagnostic information. We still, however, take special care to ensure that lead aprons are used to prevent exposure to surrounding areas of the body such as the head, neck and upper chest. Periapical radiogaphs are broad pictures of an entire tooth structure and are used to spot deep tooth problems, such as impacted teeth, bone loss, and abscesses. Cephalometric Radiographs are lateral view of the whole skull and assist Dr. Moore in assessing the relationship of the skull, and upper and lower jawbones. This is used primarily in orthodontic diagnostic workups.